HUDSON, MA - November 21, 2016- Monitoring tubing and casing pressures from wellheads helps operators optimize well production while gaining a better understanding of long-term performance. Feedback can also provide valuable information about well safety. 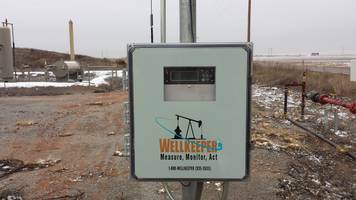 Wellkeeper Inc, a pioneer of reliable and affordable remote monitoring solutions for independent oil and gas operators, is specifying the SignalFire Remote Sensing System in their remote monitoring solutions for tracking tubing and casing pressures in the oil field. Sites using manual monitoring methods such as dial gauges are finding difficulty in managing costs, efficiency, and accuracy of operations. While reliable and low cost, dial gauges require manual intervention that proves expensive when considering the overall costs of a technician with trucks and tools. And as parameters are not monitored in real-time, unchecked problems can result in lost production or unsafe operating conditions. Wired remote monitoring systems, while eliminating manual intervention, are expensive when considering wire and trenching costs. For complex installations, wiring costs can range from $10 to $20 a foot. Signal Fire’s Remote Sensing System™ (SFRSS) helps Wellkeeper resolve many of the problems associated with manual gauges and wired remote monitoring systems. With no wiring or trenching requirements, installation costs are far less expensive than wired systems. As most wellheads are situated far from remote terminal units, the SRFSS utilizes an innovative long-range mesh networking technology specifically designed for challenging, large-scale environments. In many instances, long-range mesh networking is used to gather tubing and casing pressure data from several wells. Without this technology, many customers would not be able to monitor this valuable data as the cost of conduit and wire would be prohibitive. Also, wireless systems offer a unique benefit during workovers as wireless sensors can be easily removed and reinstalled without having to install new seals and conduit. Using the SFRSS, Wellkeeper offers comprehensive remote monitoring systems that both collect and store data, enabling users to view and analyze long-term performance trends. Besides, the remote monitoring system may be programmed to provide alarms to prevent spills and avoid equipment failure and/or damage. For more information on Wellkeeper remote monitoring solutions, visit http://www.wellkeeper.com/ or contact the company at (888-935-5533) or info@wellkeeper.com. For more information on wireless tubing and casing pressure monitoring with the SignalFire Remote Sensing System, refer to http://www.signal-fire.com/wireless-tubing-casing-pressure-monitoring-signalfire-telemetry-system/ or download our application note at: http://www.signal-fire.com/wireless-monitoring-wellhead-tubing-casing-pressures/ . Since 2001, Wellkeeper has been developing reliable, dependable, and affordable remote monitoring solutions for independent oil and gas operators. In 2014, Wellkeeper Inc. was acquired by Dixie Electric. The combination provides a full range of electrical, automation, and remote monitoring products and services to oil and gas companies. SignalFire Wireless Telemetry designs and manufactures wireless telemetry products that enable robust, long-distance wireless communication connecting multiple devices in challenging outdoor environments. In 2015, the company became a part of the TASI Group and the TASI Flow Division. SignalFire joins the TASI Flow family, a global leader in flow instrumentation, with brands including TRICOR Coriolis, AW Gear Meters, KEM Küppers, LitreMeter, and Vögtlin Thermal Mass Flow Meters and Controllers. For more information about SignalFire, visit http://www.signal-fire.com/. The TASI Group of Companies is comprised of three technologically advanced product platforms commonly linked by a disciplined focus on Test, Measurement, and Assembly. Each TASI company delivers products and services to today’s world manufacturing environments, focusing on Automotive, Medical Devices, Oil and Gas, Plastic Containers, Consumer and General Industrial markets. For more information about the TASI Group, visit their Web site at www.tasigroup.com.